TL;DR: The play felt like a badly written fanfiction of Harry Potter. If you ask me, it is not – and it will never be – a HP cannon. NEVER! Before the book came out, all we could speculate about was the meaning of the book. I imagined that the play would specifically focus on one child in particular, as mentioned in the title. It would most likely be Albus, the boy that we saw worrying about being sorted into Slytherin at the end of Harry Potter and the Deathly Hallows. It would probably have to do with some inevitable prophecy, as suggested. The word ‘cursed’ suggested to me something evil, sinister and uncontrollable. But no, what we got was Albus and Scorpius stealing an illegal Time Turner (apparently right under the noses of the supposedly greatest magicians) and making rash decisions based on emotional impulses. Yes, the theme of the plot was sweet and aww-ish, the adults trying to understand their own children and vice versa, but god, it was so childish. First of all, the characters. I did not like the grown-up Harry depicted in the books. It’s basically saying that after more than 2 decades, Harry still hasn’t learned from his past mistakes. Out of everyone, he should know how hard it is to be Albus, and the hardships of being a misunderstood child. But no, he basically acts like many parents: the decisive, stubborn ones that believe they know everything about their children. Of course, Harry’s mindset miraculously changes for the better at the end of the play, when he realizes that he has misunderstood his child all along *wow*. As for the other characters, they haven’t changed that much either. The feud between the 3 protagonists and Draco is still there (seriously?) and the couples are still together. Though we do see Ron being more openly affectionate towards Hermione, and I loved seeing scenes showing the relationship and commitment between Harry and Ginny. As for the children, most were basically non-existent, besides Albus and Scorpius. I have to mention here that their friendship reminds me incredibly of Simon and Baz, from Rainbow Rowell’s Carry On. Except that Albus and Scorpius only ever hugged each other, like, 3 times? Secondly, the plot. It was so unoriginal. The most original thing in the play was probably the complex relationship between Harry and his son, but besides that, it’s not that fascinating. 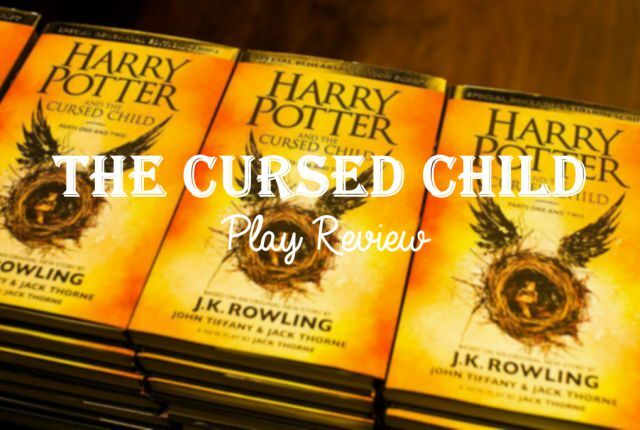 The play is built from plots from the past, specifically from HP and the Goblet of Fire and HP and the Prisoner of Azkaban. The play basically expands the dangers of using a Time Turner to return to the distant past. Additionally, it was notorious that JK Rowling did not have as much input in this play. I was used to the plot twists and big revelations in each of her 7 books, and that lacked here. It seemed that the predominant authors were trying to play-down the importance of the plot by sugarcoating it with “family issues”. Awesome. Finally, the writing style. Ugh. Okay, so I’m probably biased as I’m not very fond of the British grammar/English/whatever. But I grew to tolerate JK Rowling’s, as everything else about her books compensated for it. But for this play, it just made everything worse. I felt that there was a lack of descriptions – in this case, they would be in the form of directions – which made the play sound flatter than it could have been. And not to mention that the English was just so childish. I mean, I get that the intended audience is probably for children, but I assumed that if the play was a canon from the last Harry Potter book, the tone would be a more serious one. But no, it had this primitive writing style that seemed like it was trying to make it all end like a fluffy fairy tale. I think I forgot to mention that this was going to be a rant review, as you may have noticed if you actually read my whole review. I am totally not a fan of this play, and if you ask me about it a week later, I would deny its existence. I’m aware that my review is quite controversial to the majority of you… but this is really my opinion, and I can’t change that. Great review!!! I agree with everything you’ve said!